The temperature outside was in the teens and snow blanketed the ground, but it felt like spring inside the new indoor Wegmans Family Garden at the Buffalo and Erie County Botanical Gardens, 2655 South Park Avenue, Buffalo. 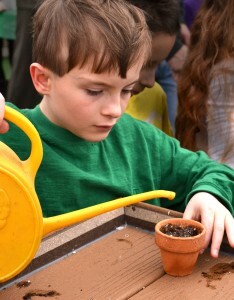 Ryan Sledz, 9, carefully waters newly planted seeds. A grand opening was held yesterday for the new indoor space, which provides hands-on activities for children that help them learn about plants and nutrition. Children of all ages and abilities can engage in free play as well as structured activities. 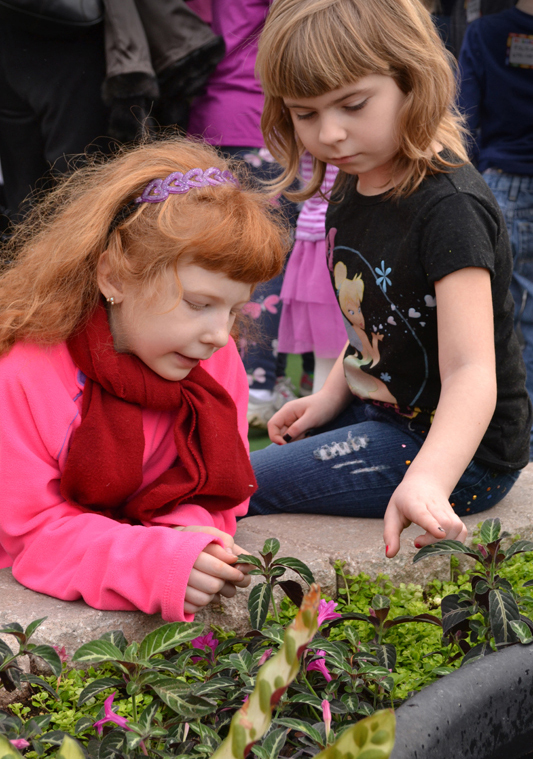 In the photo at the beginning of this article, Erin Leith, 7, left, and Courtney Leith, 6, experience the textures of plants in a garden where children are encouraged to touch the plants. The Wegmans Family Garden is located in a sunny, 800-square-foot greenhouse that adjoins the Outdoor Children’s Garden. The new space provides an area for the Botanical Gardens to offer year-round educational programming for children. 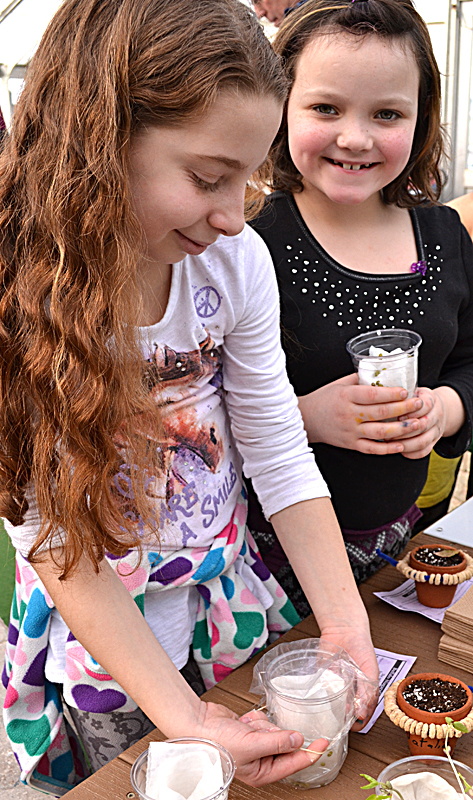 From left, Abigail Bizub, 10, Jessica Bizub, 7, and Amelia Matikosh, 4, make bird feeders using toasted oat cereal. The Wegmans Family Garden was built with a $46,000 gift from Wegmans, the Western-New-York-based supermarket. Numerous volunteers also donated hundreds of hours of time to create the new family garden. Play spaces include a potting table, water pump, sand box, fruit and vegetable garden and craft spaces. During the grand opening event, Carol Fronczak, Botanical Gardens volunteer, helped children string circles of toasted oat cereal onto pipe cleaners or chenille stems to make a feeder that they could hang in the tree to feed birds. At another station, children inserted a moist paper towel into a clear plastic cup to create a growing medium for mung beans. When the beans sprout, the children can easily see the parts of the plant, including roots, stem and leaves, and they can munch on the sprouts. 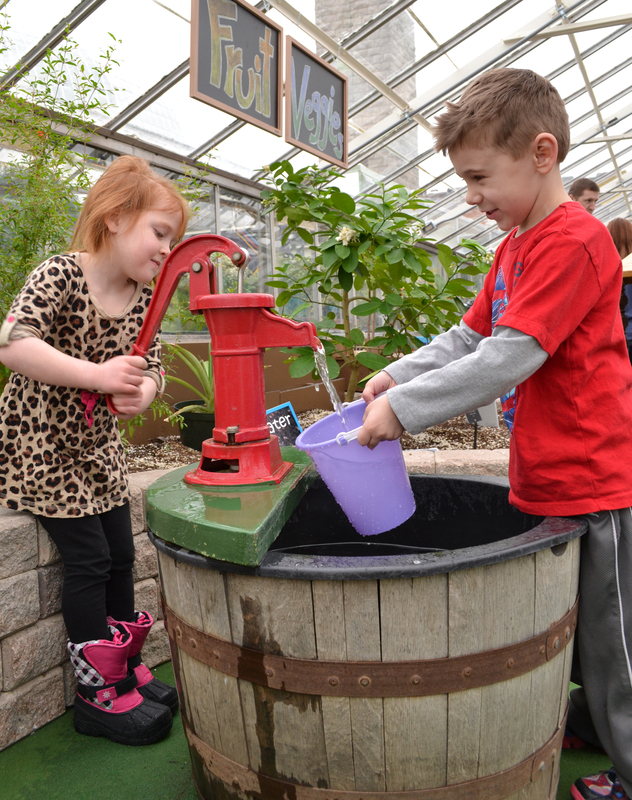 Sarah Amborski, 5, left, and Kaden Danstetter, 5, work as a team to fill, dump and refill the bucket with water. Another project had children grind wheat berries to understand how we get flour. “At Wegmans, we love our veggies, and we are always trying to get everyone to eat their recommended five servings a day,” said Theresa Jackson, Consumer Affairs manager, Buffalo Division, for Wegmans. Helping children learn that fruits, vegetables, beans, nuts and grains are plants before they become food is a step toward having children make healthy food choices. Admission to the Wegmans Family Garden is included with paid admission or with membership in the Botanical Gardens. 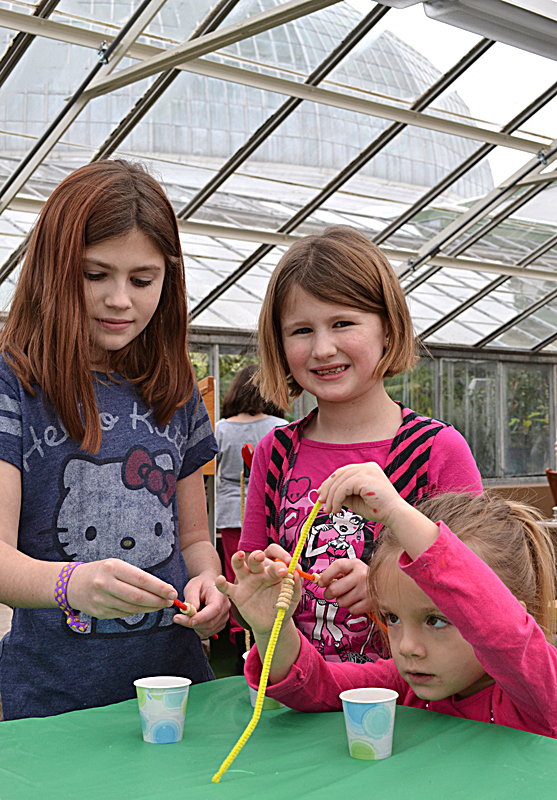 GreysinRose Hall, 8, right, has finished placing mung beans in cup as a first step in growing bean sprouts, and NatalieRose Reid, 10, left, places plastic wrap over her bean sprout planter. 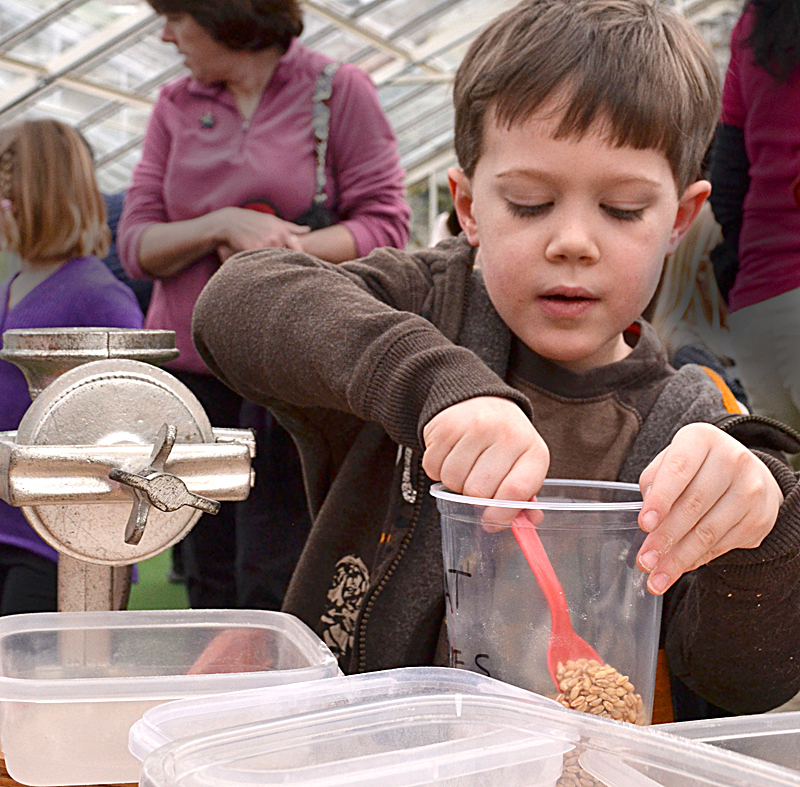 Regular food-themed programming will take place from 10:30-11 a.m. and 11-11:30 a.m. each Saturday (except March 30) in the Wegmans Family Garden. Programs are appropriate for children ages 4-10. 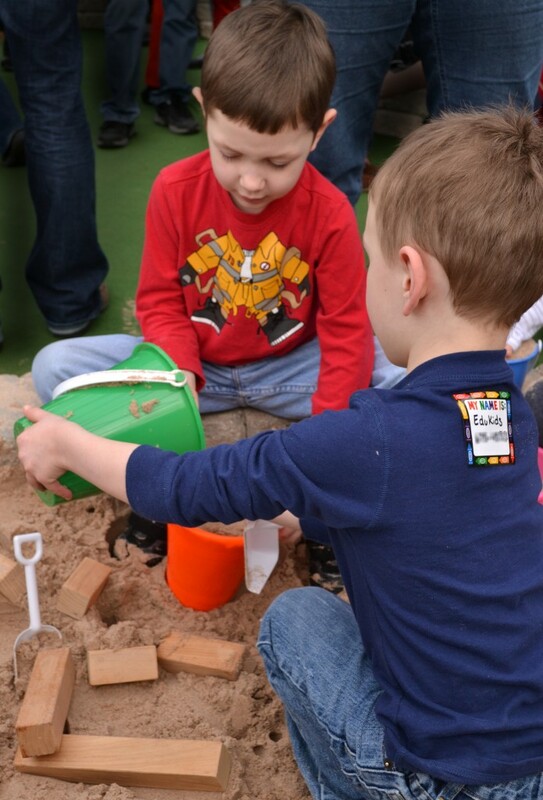 Joshua Wright, 4, left, and Matthew Wilczak, 4, play in the sand box. Griffin Trabold, 5, prepares to grind wheat berries to make flour. I am intrested in gardening horticulture classes. And can I involve my kids and how much is it and. Is wegmans project free or how much is that. The activities for children in the Wegmans Family Garden are included in admission. The Botanical Gardens offers several sets of horticulture classes for adults. Check out our Upcoming Events Page or go to the Botanical Gardens website for more information. Thanks so much for the question! This is a great idea and project that Wegmans helped create. It is a wonderful learning experience for kids that is fun too.